Some soils provide an unsuitable substrate for residential foundations and floors. This report gives guidance on some emerging site treatments (specifically the addition of cement, coal fly ash, ground granulated blastfurnace slag and lime) to improve the load-carrying capacity of soils which have historically been considered too marginal for development without major re-engineering of foundations or deep pile solutions. Overview, background and purpose of the report. Introduces the main types of soil treatment and associated European Standards and Construction methods. 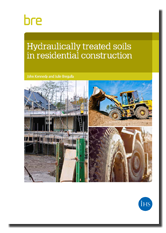 Sets out the current guidance and specifications in highways (where there has been considerable experience of soil treatment) and experience so far in residential use. Sets out design considerations and a suggested protocol for housing. Site investigations, construction, treatment mixture design, construction control, verification of treatment.